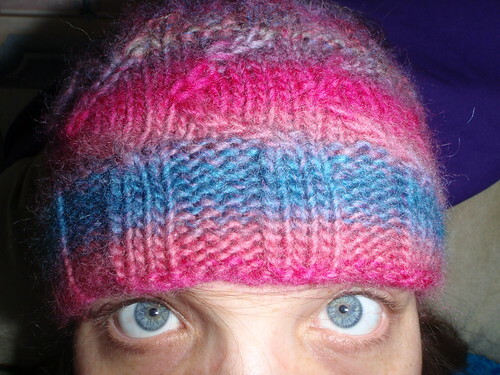 Pattern: It started off as a sea urchin but I struggled to understand the pattern and was (a) unsure I had enough yarn and (b) unconvinced this pretty yarn needed something so complex and (c) more in the mood for a skiing headband than an actual hat, so in the end I just made it up. Needle: 3.75mm for the bottom ribbing, 4mm for the rest....I literally just realised I forgot to go down a needle size for the ribbing at the other end which is why it isn't as tight. This works quite well for a head band, though. This was quite nice yarn to knit with and softened up considerably once it was worked. I think it is a Noro wannabe and, indeed, Get Knitted stocked it in the same cabinet as the Noro so it was a nice surprise when I came across it. I really love the colours and they go so nicely with both my new ski jacket and my favourite stripy thermal fleece. 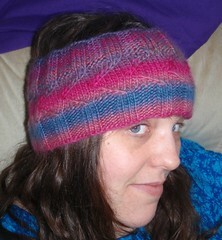 I can wear it as a cowl, pull it over my chin for chilly descents, or wear it as shown to keep my forehead warm. Unfortunately, I do have one whinge - this yarn is trying so hard to be Noro that I found a knot two thirds of the way through, followed by....yes, you've guessed it....a totally different colour! After the purple stripe towards the top of the band, the yarn descended into a rather unpleasant poo brown and then, a knot, and stormy blue. Grrrr. So, I wound out the brown and the blue until I found a pink/blue bit which blended well with the purple bit I had just finished, and then spit spliced and continued on. Then I had to spit splice about a yarn of the blue bit onto the very end of the skein to finish binding off, but oh well.